Warriors News · Oct 16 SHS has NFHS Maryland Coach of Year on Staff!! Thursday, October 15, 2015 5:15 PM Northwest High School AWAY 4 Sherwood High School HOME 2 Game Recap The girls JV soccer team started out hot with a 2-0 lead but the Northwest Jaguars came back and after taking the lead it was too tough and not enough time left to make a strong comeback. Congratulations to the Lady Warrior’s Tennis team for winning the MCPS Division II trophy! 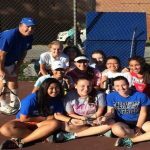 Good Luck to the Lady Warriors in the MCPS County Tennis Championships on Monday! Thursday, October 1, 2015 5:45 PM Northwood High School AWAY 0 Sherwood High School HOME 5 Game Recap The Lady Warriors finished their season with a strong 5-0 win vs Northwood. The team controlled the ball for most of the game with a lot of back passes to set up for the high pressure offense. Wednesday, October 14, 2015 3:30 PM Sherwood High School AWAY 32 Bethesda-Chevy Chase High School HOME 27 Game Recap Fabulous game against BCC Barons. Sherwood was victorious and scored 32 goals. The Barons followed with 27 goals. Go Warriors!